Watch video of the revenue panel discussion at ISOJ 2018. It is no secret that the decline in advertising revenue for news organizations has had a devastating impact on journalism around the world. In order to continue telling stories that matter, news organizations are pursuing diverse streams of revenue. This was the topic — “REVENUE: E-commerce, events, membership and the serve for new revenue streams” — for a panel on April 13, the first day of the 19th International Symposium on Online Journalism (ISOJ). The panel was introduced by Janine Warner, co-founder and executive director of SembraMedia. Alongside a team of dedicated individuals at SembraMedia, Warner works to increase the diversity of Spanish voices by helping digital media entrepreneurs become more successful and sustainable. SembraMedia’s study found that advertising is still an important revenue stream for digital native media, but outlets are also making money in more than 15 other ways. Of all the revenue streams, Warner says she believes donations have the most promising future. Alex Clark, founder and CEO of Press Patron in New Zealand, explained how his platform is making it easier for readers to support journalism through crowdfunding, membership fees and donations. Press Patron embeds donation buttons on its clients’ websites that enable visitors to become a supporter instantly. When a person clicks on the Press Patron button, a pop-up window allows them to enter their information and make a monthly or one-off donation. Press Patron started collecting donation data to see which stories make people most inclined to donate to outlets. According to Clark, the data revealed a direct link between quality and revenue. “News organizations need to prioritize quality rather than clicks,” Clark said. Instead of implementing paywalls, Press Patron encourages outlets to focus on the quality of content and make it readily available. According to Clark, the platform has found that people want to support the underlying mission of journalism and don’t want to see content restricted. For nonprofits like The Texas Tribune, which has raised more than $51 million since its launch in 2009, a blend of revenue sources is been essential to its success. April Hinkle, chief revenue officer at The Texas Tribune, said that content licensing and editorial events, in particular, are critical revenue sources for the organization. Much of the content that The Texas Tribune creates is given away to other media outlets, but the organization also licenses content for a variety of products, including documentaries, coffee table books and most recently, government textbooks. Licensing, Hinkle says, allows The Texas Tribune to continue generating profit from content long after it is first produced. Editorial events, which serve as another major revenue source for The Texas Tribune, are at the core of the organization’s identity. According to Hinkle, they have been important in The Texas Tribune’s business model since the very beginning. “We believe that people need to come together to discuss our state’s biggest issues,” Hinkle said. Last year alone, the organization brought Texans together at 62 events in Austin and around the state, which included conversations, symposia and the annual Texas Tribune Festival. All events are open to the public and streamed live on The Texas Tribune’s website. When it comes to sponsors, Hinkle said The Texas Tribune makes sure they know each sponsor’s purpose for supporting an event and that sponsors understand that they have no influence on the discussions at events. News Revenue Hub, an organization based in San Diego, helps digital news organizations generate revenue by giving them the tools and research needed to build an effective membership strategy. Christina Shih, chief operations officer of News Revenue Hub, explained how the organization is using email to help clients generate revenue with memberships. According to Shih, since the News Revenue Hub launched in 2016, it has raised more than $4.3 million for its clients. One of its most important strategies, she says, is having clients take advantage of emails. News Revenue Hub teaches clients how to create engaging, personal emails to send out to readers that help foster more intimate relationships. “Most readers don’t understand that their donation has a direct impact on your reporting, and your reporting has a direct impact on the conversations happening in the community [and] policy,” Shih said. News Revenue Hub encourages clients to explain the struggles that they are facing in their newsrooms to their readers. By building a genuine relationship prior to asking readers to buy into a membership, Shih said they already know why a newsroom deserves their support when they do eventually ask for it. Rob Wijnberg, editor-in-chief and founder of De Correspondent in the Netherlands and The Correspondent in the U.S., closed the panel with a presentation of the innovative strategies that his publication is using to generate revenue. Wijnberg launched De Correspondent in 2013, after raising more than $1.7 million in eight days through a crowdfunding campaign. Since its founding, De Correspondent has been free of advertising. All of its content is only available to paying members, but those members are allowed to share it freely. According to Wijnberg, the publication grows its membership by giving its undivided attention to readers. All stories De Correspondent produces start by asking readers who are experts on subjects for help. The staff also engages with their audience directly on the site in a contribution section, rather than a comment section. Design is incredibly important at De Correspondent, which has 10 developers who built its content management system (CMS) in-house. The outlet’s design features user-friendly elements, such as context buttons that define terms, and links that are contextualized and incorporated into stories as sidenotes. 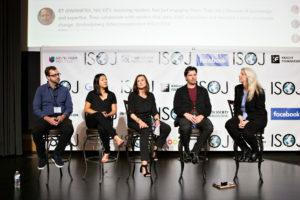 For 19 years, ISOJ has brought media executives, journalists and academics to Austin, Texas for a discussion on the present and future of online journalism. The conference continues tomorrow, April 14. Live streaming is available in English and Spanish at https://isoj.org/. Raw video of Friday’s panels is available on YouTube. To view the morning sessions (including the revenue panel), click here. To view the afternoon sessions, click here.